Msgr. 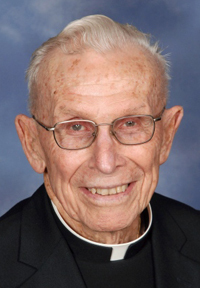 James E. Mortimer, 91, pastor emeritus of St. William Parish in Philadelphia, died Feb. 2. Born in Philadelphia, the son of the late James E. Mortimer and the late Ellen (Deegan) Mortimer, he attended St. Bartholomew School and St. Joseph’s College High School before entering St. Charles Borromeo Seminary. He was ordained May 10, 1952 at the Cathedral of SS. Peter and Paul by Archbishop John F. O’Hara and his first assignment was as parochial vicar at St. Jerome Parish, Tamaqua. He then served on the faculty of St. Thomas More High School and Cardinal Dougherty High School. He is best remembered at Dougherty as the moderator of the legendary Cardinal Dougherty High School Band, which during a 1966 tour of Europe played for Pope Paul VI at the Vatican, for Princess Grace Kelly and won first place at a World Music Festival in the Netherlands. They also performed during the 1965 inauguration parade for President Lyndon Johnson. Msgr. Mortimer also served as principal of St. Pius X High School and Cardinal O’Hara High School. In 1980 he was named pastor of St. William Parish, where he ministered until 2002 when he was named pastor emeritus. Once she recalled, she was robbed on the street. After that Msgr. Mortimer directed that whichever priest was on call at night would have to drive her home. Father Joseph Watson, who was a son of the parish and later pastor of St. William himself, said his vocation was influenced by Msgr. Mortimer. But she especially remembers his devotion to the Blessed Mother. “I went to Lourdes with him twice and also to Guadalupe,” O’Reilly said. Ken Houser, the music director at St. William’s, has many good memories of Msgr. Mortimer, who allowed him from childhood to use St. William’s organ. But perhaps his most telling memory has little to do with their mutual love of music, but of Msgr. Mortimer’s retirement years. “He always shared at our Divine Mercy Masses that his most enjoyable experience was spending time in the confessional, particularly spending hours upon hours, days upon days hearing confessions at Lourdes, a trip he looked forward to each and every year,” Houser recalls. There will be a viewing for Msgr. Mortimer at St. William (lower) Church on Friday, Feb. 8 from 4 to 8 p.m. On Saturday, Feb. 9 there will be a viewing from 8:30 to 10:30 a.m. followed by his 11 a.m. funeral Mass with Bishop Timothy C. Senior as the principal celebrant. Concelebrants will include his seminary classmates Msgr. William J.J. O’Donnell and Father David B. Machain, also Father Alfonso Concha and Father Watson, who will be the homilist. Msgr. Mortimer is survived by his sister, Ellen V. Jones and nieces and nephews Michael, Thomas, Daniel, Ellen and Theresa and their families. Interment will be at Our Lady of Grace Cemetery, Penndel. Eternal rest grant unto him O Lord and let your perpetual light shine upon Msgr. James E. Mortimer. Rest in peace, Monsignor. Thank you for all you did for my family. In 1988, Monsignor Mortimer led my wife, Karen, through a private RCIA program to help her with her plans to become a Catholic sooner. Every Wednesday night, Karen and I met with Monsignor at the rectory. I was also enriched by these sessions, as I learned more about my own faith. Karen was confirmed by Monsignor Mortimer in the fall of 1988. Then, in 1989, Monsignor baptized our son, Joseph. Monsignor Mortimer, we wish you a swift journey to Heaven. May God bless you! Truly a holy man! I remember from the 60’s being his altar server at St Aloysius in Pottstown. I saw him and had dinner with him a few years ago. I was truly honored!!! Rest in Peace with God! Rest in peace Father Mortimer. You made the Dougherty band and drill team the best in the country and I thank you for letting me be a part of it from 1966 to 1969. God bless you. While he was very quiet about this, I am told that Monsignor was cured of cancer at Lourdes which is why he was such a faithful Confessor there for many years. Rest in peace! You truly were an inspiration to me, very well liked and will always be remembered. May God bless you! !